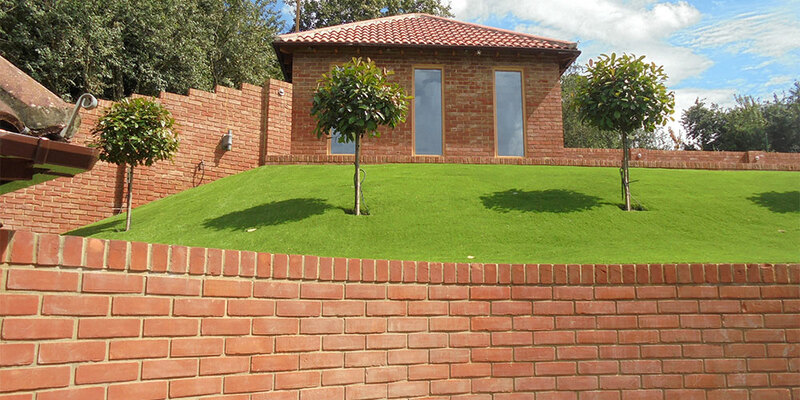 We have previously provided you with a general guide to installing artificial grass. 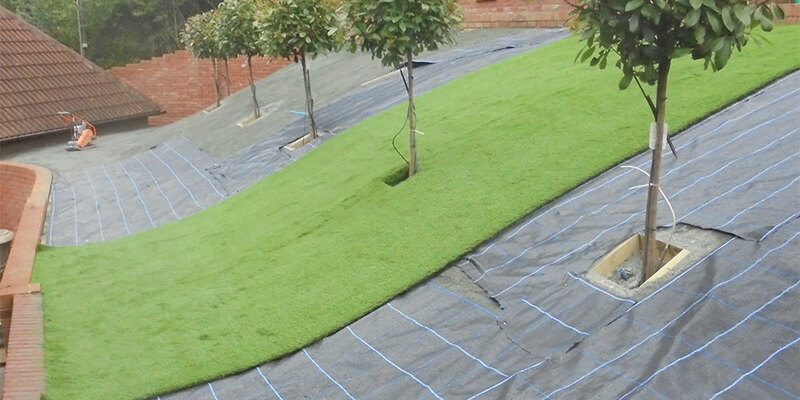 Here we will guide you through installing artificial grass on a slope. 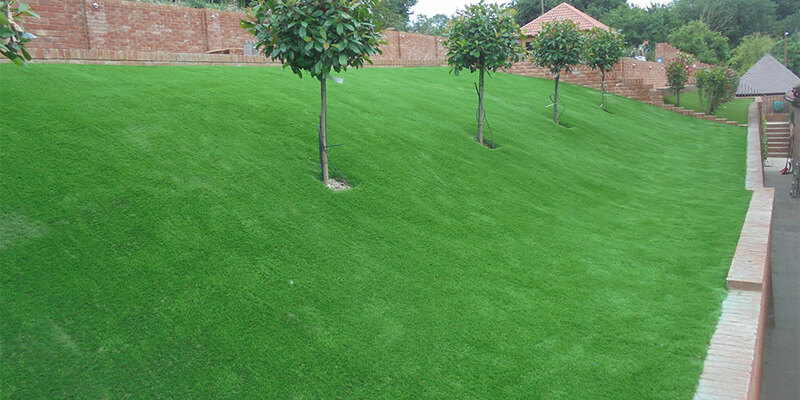 It can be very difficult to maintain real grass on a slope for a number of reasons: It can be difficult to cut with your lawn mower and general watering, weeding, hollow coring, fertilizing and all the other treatment real grass needs can be equally tough. Remove any grass and debris from the sloped area on which you want to lay your grass. 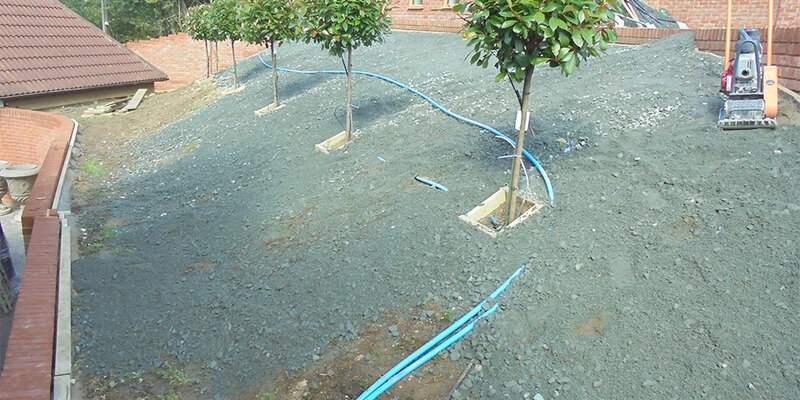 To hold the grass firmly in place and to stop it from sliding down the slope we install 4″ x 2″ treated timbers along the top of the bank. To keep these firmly in place we concrete them in. Having layed the hanging timbers we now place 3″ x 2″ timbers around the rest of the perimeter as we do for a regular installation. In this example we also used these timbers to create boxes around our shrubs. Try to get an even distribution of 2-3 inches of Type 1 across the slope. Where the bank is very steep you will need to tamper it into the bank by hand. Not fun but worth it in the long run! Apply approximately 1 inch of granite dust across the surface. We use a heavy piece of timber to bind the granite dust into place as no Wacker can be used. Place the Membrane on top of the granite dust on a slope otherwise the aggregates will not bind to the bank and will simply slide down the hill. Fit the artificail grass as normal. This isn’t easy when sliding down a bank! My advice is to get the grass lined up and then heavily nail it into the fixing timber first so it won’t move. Once our joins are stuck in place we nail them until the glue dries. This is important on a bank as the grass doesn’t always sit flat. Once the grass is installed and nailed and tucked around the perimeter we sand it heavily to push the grass into the bank. The final step in the process is to powerbrush the grass. A little maintenance will then be needed throughout the year to keep it in tip top condition. If you have any further questions on installing artificial grass on a slope please leave them in the comments section below and I will answer them asap. Great information! We have a snake shaped footpath cutting diagonally up through the centre of the very sloped backyard, so putting a long straight length of concreted sleepers in isn’t an option. Should we concrete in short sleepers that change direction to follow the stairs, or could we concrete in say a timber stump (roughly 6″ diameter) in every metre or so, to nail the grass in? (We have rock hard clay so digging is near impossible!) Thanks! I’m looking to install around 12-15m2 worth of artificial. But our garden is on bit of a incline from the house upwards. Also we are planning on having cotsworld stone around the edge of the grass along the face and patio. Is it worth having a timber edging around the area to hold the stone in place and have a better look with the artificial grass once it’s done or does it not matter either way. Hi yes we always concrete in a 3 /2 timber frame it will define the edges and leave a clean finish , as well keeping the base in place and stop dipping. You would either need to dig the high end down more or simply raise the lower area up by have a retainer in the lower end ie a sleeper and build upward. Could I send you a photo through your Facebook page to make it easier? Just wanted some advice please, I’ve arranged for someone to lay artificial grass on a slope 23 ft by 10 ft. He is raking the soil to try and create a smooth surface but hasn’t mentioned using type 1 or granite dust. He is planning on laying the membrane and then the artificial grass. Is this ok in your opinion or would we envisage any problems? Please could you advice? Hi there , it sounds like one of the worst installs ever! Do not let this person touch your grass as once its laid and cut you have wasted your money. The grass will slide down the slope, it will look awful as the soil moves and lumps and bumps appear. The grass needs proper groundworks under it. 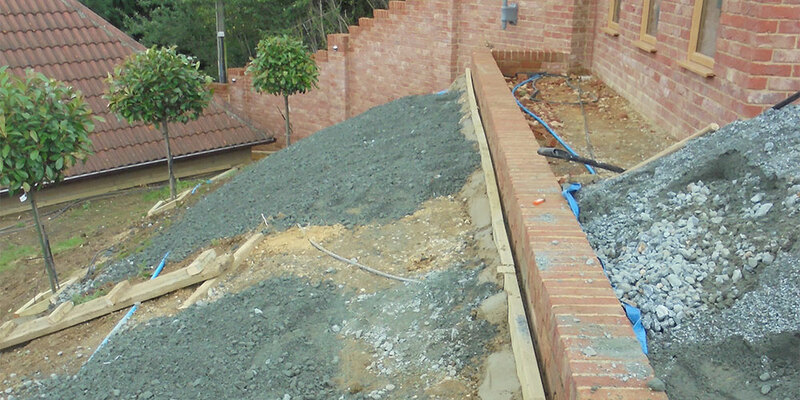 A fixing timber is always concreted in around the edge but this is more important on a slope as the top timber will act as a hanging timber and stop the grass from moving down the bank. Aggregates like type 1 packed in to the bank will prevent dipping and the granite on top will create a long lasting surface to fit the grass on. Thank you for a really helpful article. I am planning on laying artificial turf on a bank that is set at 55 degrees. I was wondering if it would be worthwhile installing a grid of plastic cells inside my wooden frame/hanging timbers and filling them with Type 1 followed by a 1″ skim of tamped granite dust to provide stability. Also, can you advise if I should think about installing drainage at the base of the bank to deal with any run-off? Hi there yes that is certainly an idea and would work as long as they can’t move. I personally believe that will enable better drainage so any more at the bottom wouldn’t be needed. Thank you this has been really informative as we are doing this ourselves as a DIY product but want to achieve a really good finish. Hi is there any other base you can use besides granite dust I’m having difficulty finding anywhere that sells it up my way there is granite sand but I’m not sure if that’s the same? Hi if you can’t find simply go deeper with the Type 1 and use as little sharp sand as possible to get the area nice and smooth. 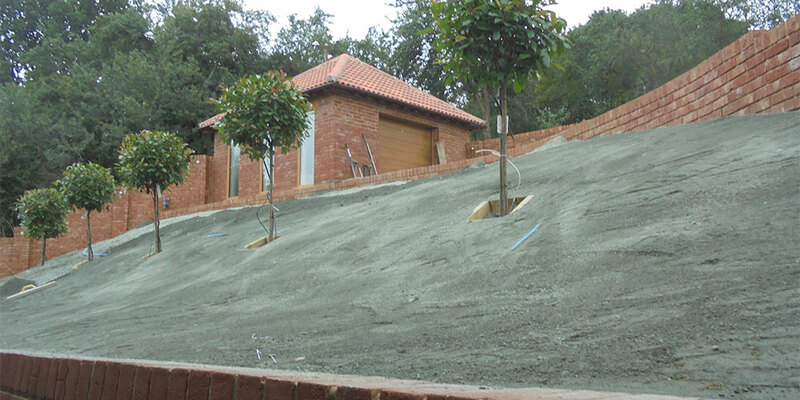 Hi we have covered an area of Tarmac which is on a slight slope but dirt runs down on to edge when it rains heavily. It looks terrible any ideas to sort this problem would be grateful. Hi not really artificial grass related , but I would suggest maybe concreting in some sleepers along the top edge to prevent this. Hi, thanks very much for being so informative! Can I just ask, why granite dust and not soft sand? I’m assuming granite dust probably binds better and holds onto the slope?? Just that my lawn area is only a slight slope. Hi there, yes exactly that, granite binds together to form a rock hard surface however it is still porous, so water can escape. It doesn’t mater if it’s a slope or not sand simply does not provide the right surface to lay on and it will simply get washed away over time. We have a bank of similar dimension and slope. Is there a ball park figure for what this costs to install? Hi this bank totalled nearly 250 sqm if I remember correctly. It will all depend on access. To save costs the owner of this house hired a dumper and piled all our aggregates up at the top of the slope, and it didn’t need digging out. I personally think you would be looking to pay around £75 per sqm inc vat as they are really very tricky to do. That’s if they are actually feasible projects. Hi I bought used football field turf on smaller sections such as 20’x7′. I was planning on using lawn staplers. Will those not work? Hi no these will not work, if they are in small bits and you wish to join them together you will need joining tape and glue. However, it will look like a patchwork quilt and working with second hand grass is a big no no. Thanks for the information, about to attempt to lay some artificial grass on a slope, myself, the tips were a big help! Hi the most important consideration is to concrete in ‘hanging timbers’ otherwise the grass will move. We use 4 x 2 treated timbers and heavily concrete these in along the top of the slope allowing for a small gap between the timber and the top wall/fence etc so we can get a tuck in when fitting the grass. Once these timbers have set we nail the grass into them to avoid any movement.